The International Consumer Electronics Show (CES) just wrapped up in Las Vegas, once again generating its annual torrent of gadget headlines. Even though it seems like barely half of the products ever actually make it to market (“pricing and availability to be announced!”), it’s certainly the single largest global showcase of where technology and manufacturers think things are headed. 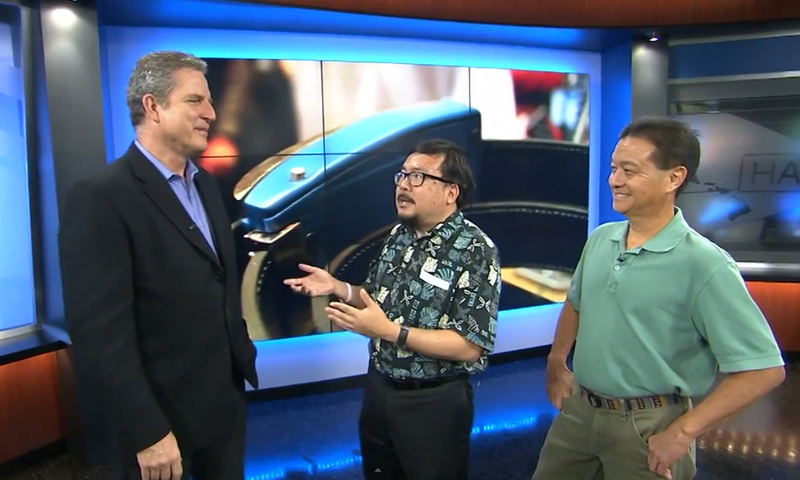 For this morning’s “Geek Beat” segment on Hawaii News Now’s “Sunrise” morning show, Burt Lum and I picked out three top things from this year’s show. Belty from Emiota is a “smart belt.” Like last year’s vibrating fork, this gadget dominated much of the novelty coverage of CES. Spend too much time at a desk? Eat too much for dinner? Belty knows, because it has sensors and an accompanying app that can track your movement and waistline. But Belty’s mechanical feature allows it to loosen or tighten it’s grip around your middle depending on your level of comfort. After all, a neatly cinched belt might feel just fine when you’re walking down the street, but when you sit down for a few hours, it can be too tight. The fourth notch in your belt might be fine in the morning, but not after a dinner at Vintage Cave. Belty to the rescue! Depending on your point of view, it’s either a clever re-thinking of a “technology” that hasn’t been updated in centuries, or a sad commentary on the state of Western civilization. In the era of “Black Mirror,” it’s easy to suspect this thing is just one long con, a brilliant piece of technological satire. This “luxury” accessory will hit the market in time for the holidays. Really! Nixie is “the first wearable camera that can fly,” though the tech press has shortened that to “selfie drone.” The company was co-founded by Christoph Kohstall, a former postdoctoral researcher at Stanford, and Jelena Jovanovic, a former Technical Program Manager and Tech Lead at Google. The pair says they came up with the idea when they missed capturing their daughter’s first steps. “With a gesture, Nixie takes off, captures the moment, and comes right back,” Nixie promises on its site, and its videos highlight situations where you may not have any hands free to launch a quadcopter-mounted camera. The project recently got a $500,000 boost as the grand prize winner in Intel’s “Make it Wearable” challenge. It’s still in “early development,” which means they’re a long way from actually having a product to sell, but at CES they were able to demonstrate its “boomerang mode,” in which Nixie takes a photo or video of you then flies back to you. Finally, Bionic Bird is promoted as the “world’s first smartphone controlled bird.” Like many of today’s new and unusual ideas, this one got its start as an Indiegogo crowdfunding campaign (describing the gadget as a “furtive drone”). Building on over 40 years of research and development by aeronautics engineer Edwin Van Ruymbeke, the team wanted $25,000 to get started, and they ended up raising $155,000. Instead of propellers, the Bionic Bird flaps carbon fiber wings. And instead of a complicated remote control, the Bionic Bird is piloted by an iPhone or iPad app. It’s durable (read: crashable) and decidedly non-threatening to other birds… or cats. Indeed, much is made of the Bionic Bird’s potential application as a cat toy. Unlike many headline-grabbing projects, this one may actually ship as scheduled next month. It costs 99 Euro, or about $116 today. And the company is already looking ahead to the next generation of “Bionic Bird,” which will be capable of stationary flight and carry an on-board camera.